Our VW Bus Photo Booth in Toronto isn’t just restricted to the GTA – We travel from party to party all over Central Ontario to bring the hippie flavour to all sorts of events and weddings. 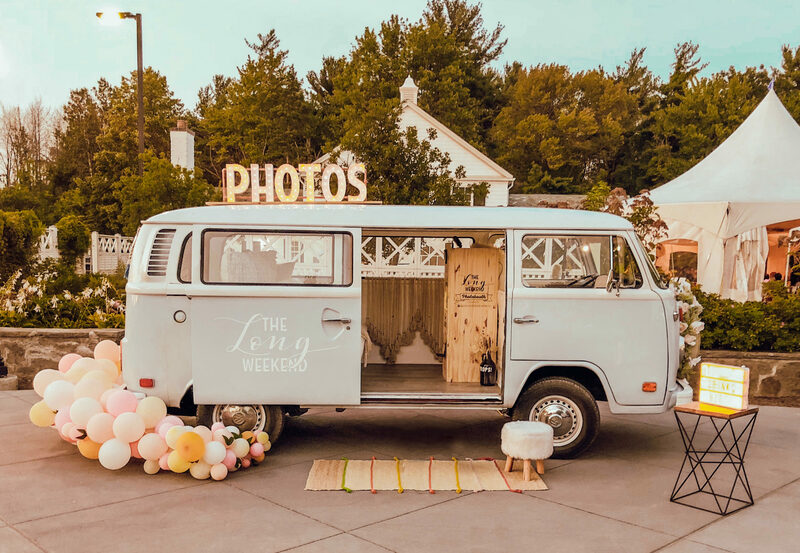 Our mobile VW bus photo booth is available for any event we can drive to, and we have dozens of customizable options to make sure your pictures match the look and feel of your event. We have a full touch screen photo booth that sits inside the VW van that takes photos with a high quality DSLR camera, so guests get to sit in the bus while they take their shots. Photos print out automatically at the end of the session, and a digital copy of all photos get sent to the couple after the event. The border of the prints are also fully customizable, so you can print anything form a 2×6 with 4 photos in a strip like your old favourite mall photo booth, or a 4×6 with your company logo for big impact. We also have a bunch of add-ons that can go with this package including customized signage, custom props, and other unique details if you’re looking for a little something extra. Check out the gallery here for our options. For more information about our VW bus hashtag photo booth rental or to ask any questions that aren’t answered here, send us an e-mail!